It isn't too surprising that death rates rise during the winter in frigid climates. But who would expect the same increase in mortality during Los Angeles winters? New research shows that winter, no matter how balmy, is a dangerous time for your heart. Dr. Robert Kloner and Dr. Bryan Schwartz led a research study at Good Samaritan Hospital in Los Angeles to evaluate seasonal influences on mortality. They looked at death records from seven cities across the country for the years 2005 through 2008. They selected cities in California, Texas, Georgia, Arizona, Washington, Massachusetts and Pennsylvania to survey a broad range of climates. 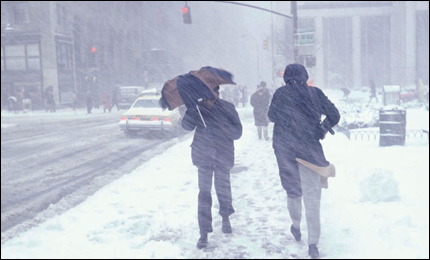 The researchers expected cold weather to play a role in cardiovascular deaths. Cold temperatures cause blood vessels to constrict (get smaller) which increases blood pressure. Higher blood pressure can trigger strokes, aneurysms and heart attacks. The data were surprising. All seven cities had essentially the same seasonal variation for deaths. No city was statistically different from the others. All of the cities showed a 26-36 percent increase in deaths between the low point in the summer and the high point (mortality wise) in the winter. Clearly, the climate was not the underlying cause of this seasonal variation, otherwise California in the winter would mirror Washington in the summer. The researchers believe that human behavior is the cause. In the winter, regardless of outside temperature, people tend to exercise less and cheat more on their diets. This tells us that the winter is when we need to be even more vigilant to maintain our healthy eating habits and continue our exercise. Even a walk around the block can help. Don’t let the winter doldrums lull you into unhealthy behavior!